Christmas is less than a week away! I can not believe it! But we are oh so excited, and SO THANKFUL that our break has officially kicked off! Right before the break started, Cute's teacher decided to host a fun holiday party themed around How the Grinch Stole Christmas. 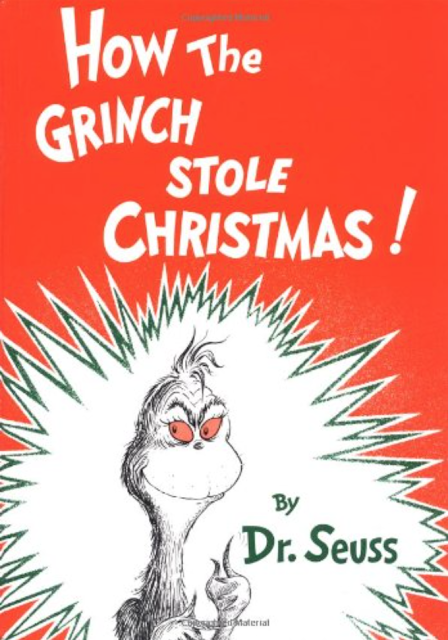 Now you know we love our Christmas themed books - for both kids and adults - so we were excited to get to have a little fun with one of our long time favorites. The Cutes absolutely love reading The Grinch and watching The Grinch movies over and over. It's been awhile since we've popped in for a little Children's Book Club post, but thought this fun time of year deserved a revival. If anything, it at least might give some a fun activity to do with with a classic favorite with all this icky rain and snow going on everywhere. My part for the party was to make a Grinch themed treat. After a Pinterest search (thanks Pinterest! 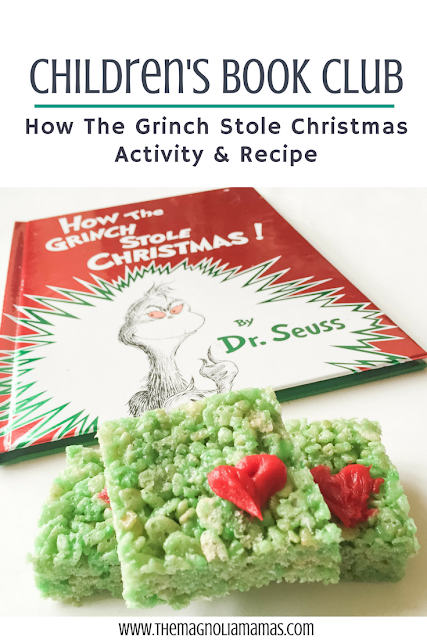 ), I decided to do Grinch themed Rice Krispy Treats. These were super quick and easy to make, which was key at the end of the semester! 1: In a medium sized sauce pan melt the butter and marshmallows until well blended. 2: Add in green food coloring until desired color. 3: In large mixing bowl stir Rice Krispy cereal and marshmallow mixture together. 4: Place wax paper on a pan or a 9x12 dish. 5: Spread Rice Krispy mixture out evenly and let cool. 6: Once cooled, cut to desired size and then use frosting to make red heart. See super easy! The hardest part is not eating the warm marshmallow mixture! What is your children's favorite holiday book?